Property 14: 3/2 Bedroom, 2 Bath, Lakefront with sandy beach walk in no drop off wall. 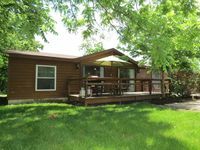 Property 17: Log Cabin Cottage in Gem Beach, One Block from Beach! Property 21: This is a quiet get away that is close to everything. Property 29: Lakefront Cottage with Amazing Views in an Ideal Location! Property 30: Our Little Secret is Out!